The comprehensive visual guide every Saniwa has been waiting for! A comprehensive visual guide to the Touken Danshi - the manual for every Saniwa is coming out this summer! Contains images of the Touken Danshi poised for battle and illustrations by Uchiban, as well as a collection of the special-move illustrations rarely seen even in-game. But that’s not all, it’s packed full of all-new incredibly detailed images that have never been seen before! This collection features 46 different Touken Danshi, including Akashi Kuniyuki, who debuted the first week of May 2015, as well as in-game navigator Konnosuke and other non-Touken Danshi characters. 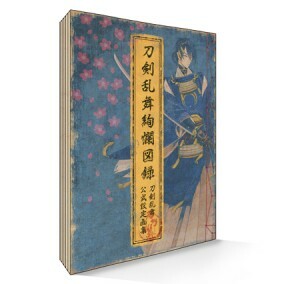 This one book provides you with an extensive compilation of visual details for the Touken Danshi featured in Touken Ranbu -ONLINE-. Learn more about the unique elements that create Touken Ranbu, and enjoy the game even more. Special pamphlet “Touken Ranbu Giga” and Comic Market 88 event bonus A4-size file folder not included. First available at Comic Market 88.